I’ve often described the Augusta Heritage Workshops, on the campus of Davis & Elkins College in Elkins, West Virginia, as a place where you can walk the streets any hour of the day or night singing out loud to yourself and no one will think you’re crazy. Someone might even come along and start singing harmony with you, or whistle up an accompaniment. Augusta is a great place to be if you’ve got rhythm going on in your head all the time. A while back, some TV interviewer asked Paul McCartney why he still writes and performs songs. McCartney looked at the guy for a moment, and after a slight pause, answered, “Ummm…it’s…what I do.” The unknown kid that McCartney once was heard music in words, and the songs just spilled out of him. If he had never become famous, no doubt he still would have made music. It’s what he does. I can’t imagine anyone who goes to Augusta asking that question. For 51 weeks out of the year, most of them work some kind of regular job. They teach school, or work for the government. They’re social workers or media people. If you ask, you might turn up a NASA scientist, an astronomer, a computer geek or two, an administrator, a business owner, an engineer, an appliance repairman. One accomplished old-time fiddler is a Hollywood animator. For a lot of them, in their workaday worlds it’s important to have a string of letters after their names so everyone will understand who they are. But for one week out of the year—maybe two or three—at Augusta we’re all singers and musicians and dancers. This time last week, some of us were hauling ourselves out of our dorm room beds where we had flopped for only a short time, and were preparing to make our way to the chapel for the Sunday morning ceremonial rite that always closes out the five week-long summer sessions. Earlier in the week, folks were commenting on the power and style of student Wesley Cantor’s voice, and someone knowingly predicted, “He will be famous some day,” which reminded me of what my anthropology professor, Stavros Deligiorgis, had to say about fame. “The word ‘fame’ is related to ‘flame,’” he said, and described the tongues of fire that scorch, burn, and often engulf the famous. And I remembered Ken Kesey’s description in Rolling Stone magazine of John Lennon breaking up a brewing fight in the Abbey Road studio simply by walking into the room. Kesey said that Lennon had been burnished in the white-hot fire of fame that decimates many a lesser mortal. Maybe an unrequited lust for fame lurks behind the curtains of most of our psyches, at least until we get a taste of the negative side of being famous. I laugh when I think of someone like Elvis Presley auditioning for “American Idol.” But I could easily see Elvis, John Prine, Janis Joplin, B. B. King, Billy Joel, Bessie Smith—even Paul McCartney—hanging out at the Ice House or on the porch at Halliehurst, having the time of their lives just making music for the joy of it. I don’t mean to ignore the crafters, scholars, and cooks who come to Augusta to learn about stuff such as timber framing, quilting, Cajun cooking, instrument repair, blacksmithing, painting, etc. etc. etc. but they usually aren’t the ones who are whooping it up on Hallihurst porch at 4 a.m. Correct me if I’m wrong. First time Augustians Linda Frank and Wesley Cantor kick back with instructor Ed Norman outside the Ice House. Ed and Tim Wells, the Maudlin Brothers, taught a course on Jubilee quartet singing. Photo by Vic Lukas, used by permission. 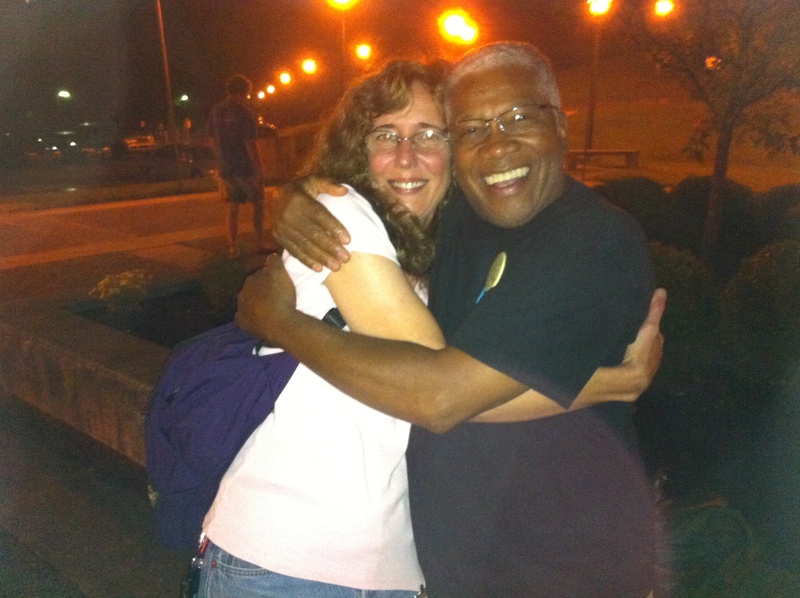 Linda expresses her gratitude to Charles Williams, instructor for “Finding Your Voice” at Vocal Week since 1985. Photo by Vic Lukas, used by permission. Sorry I’ve been absent so long. I never lack for subjects to write about; the big problem is time. It just occurred to me that time management is more likely the issue, but this week, it’s definitely a lack of hours in the day exacerbated by a lack of sleep. I have been debating all day: should I write, or should I seize the moment of opportunity to nap before the next onslaught of fun? The reality of the Transcendent New Nation of Appalachia first occurred to me one evening in the late 1990s when I was standing on the porch of Halliehurst, a magnificent remnant of the Gilded Age that stands on the campus of Davis & Elkins College, in Elkins, West Virginia. 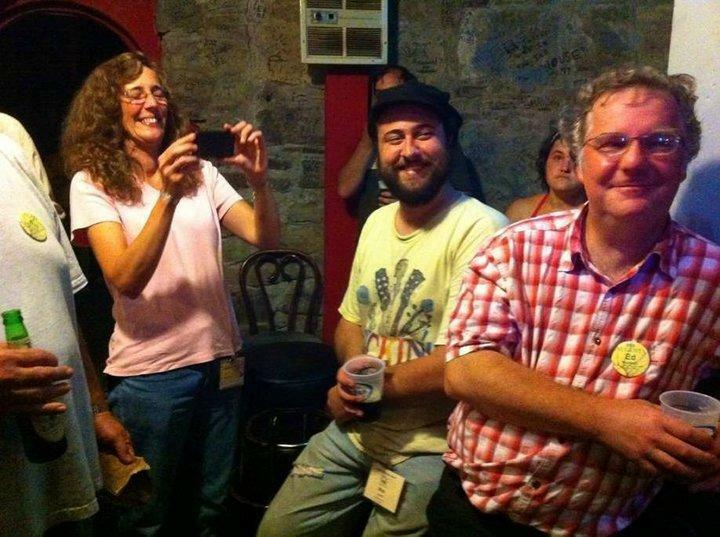 The final week of five devoted each summer to traditional music, dance and craft was in progress then, and a more congenial, fun-loving, talented bunch of folks I had never encountered. Augusta, short for Augusta Heritage Workshops, takes its name from the proposed 14th American colony that never was. The story goes that George Washington was planning to decamp to this region if the Revolutionary War had not gone his way. A substantial number of Washingtonians and their neighbors, along with others from a wide variety of places around the globe, escape regularly to Augusta now. I’ll be back on the porch of Hallihurst this evening at some point, where multiple music jams will be occurring simultaneously, and singers will be forming in ad hoc groups to share harmonies. If you’ve never sung harmony and have no frame of reference for understanding the total body experience that harmony singing produces, think of it as a full body buzz that’s a combination of massage and…well, let’s just say that it’s an intense physical as well as aural pleasure. So I’m at Augusta once again for a week that is packed full of singing and music and dancing and laughing. I’ll post photos, and maybe even some video if I can get it together. It’s 7:18 p.m., and I’m on my way to a “student” show, where the folks who have paid to come here for a week to hang out with master musicians and dancers will strut their stuff. Many of the students are accomplished musicians and dancers who have come to expand their repertoire. At 10:30 the grand do wop begins in the Ice House. More about that later, too. My nap time is gone, but I feel better now that I’ve checked in with you. Stay tuned for more reports from Ground Zero of the Transcendent New Nation.